Welcome to day three of our Deck the Halls with Inky Paws week! Each day this week we will have a new awesome featured guest and then a BIG blog hop on Friday, December 4th (with some give-aways, of course!) So make sure you come back and visit us every day! Hi! 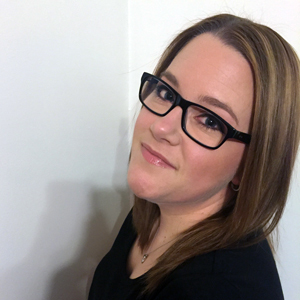 My name is Stephanie and I have been a part of the paper crafting industry since around 2003. I love to create and share my creations online on my blog as well as my other favourite social media site, Instagram! I have been published with various paper crafting magazines throughout the years, including Scrapbook and Cards Today, Creating Keepsakes and Simple Scrapbooks, among others. I originally started out as a scrapbooker, but focus most of my craft time now on cardmaking. I reside in Ontario, Canada with my husband Steve and two children, Caitlyn and Ryan. I work full-time in an administrative position and spend the rest of my time hanging out with family and friends, crafting, watching NHL and Nascar and reading on my kindle. 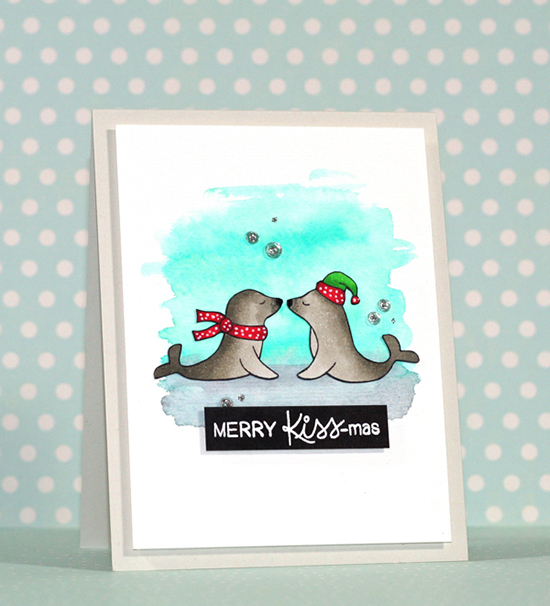 Stephanie created this adorable "KISS-mas" card using our Holiday Smooches stamp set. Aren't those kissing seals so cute? I love how she added in polka dots on the scarf and hat! The simple card layout with the watercolor background is super cute too! 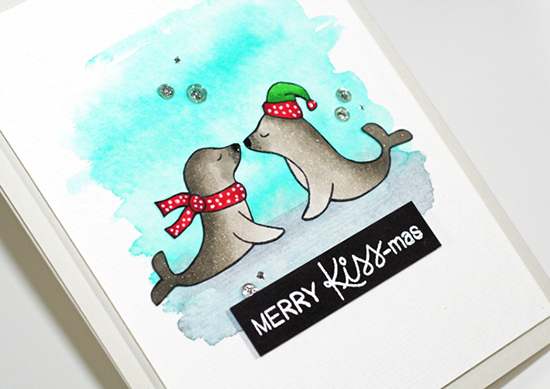 The "Merry Kiss-mas" sentiment she used is also part of the Holiday Smooches stamp set along with some other cute kissing animal couples! Thanks so much, Stephanie for being our guest today! She will be back for our Deck the Halls with Inky Paws blog hop on Friday, December 4th. Until then, you can visit her at her blog, Round Here to read more about her adorable projects and say hello! so make sure you take some time to come back and visit us again! A Kiss-mas cute card in every way...Love it! Love this card! Super sweet Stephanie! Love this; it is so adorable! This stamp image gave me a good chuckle, sweet! Fabulous coloring. Cute card esp. with the great background. Merry Christmas from us - See you next year! We wish you a merry KISS-mas! Mirror Stamped Fox Card by Lydia Evans! Deck the Halls with Inky Paws Blog Hop Winners! Deck the Halls with Inky Paws Blog Hop!